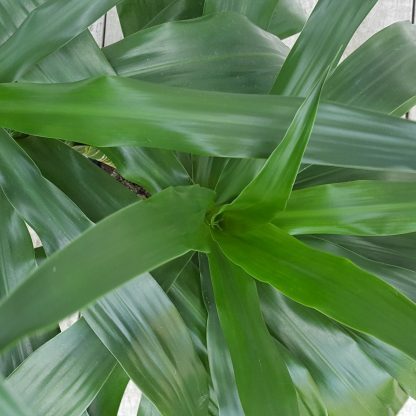 Turn your home into a lush oasis with the long relaxed green leaves of Dracaena Janet Craig. This Dracaena stands 100cm tall (approximately) from the bottom of the pot to the leaf tip. As it grows taller it will form a taller cane-like stem with a cluster of leaves at its top. Dracaena are super easy to care for and this variety is happy in a room with moderate to bright light (no direct sunlight). Dust leaves occasionally with a damp cloth. 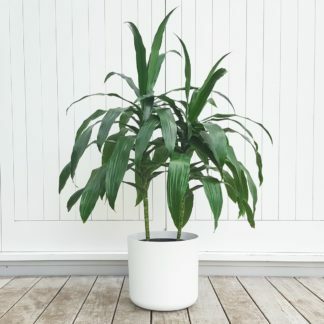 We’ve paired this plant with a lightweight white plant pot, cylindrical in form with a rounded bottom. It has a lovely matt finish and is 30cm diameter (no drainage hole).